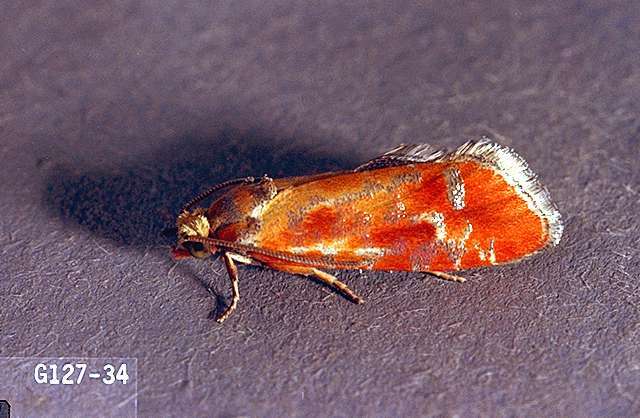 Pest description and damage Adult moths are reddish-orange with silver markings on the wings. The mature larvae are about 0.63 inch long and reddish-brown with black heads. The larvae of the European pine shoot moth feed on the terminal buds. They first bore into needles or base of the bud. Next the larva bores partially into the buds and weaves a small web between the two, and seals it with pitch. Eventually the infested buds are covered with what appears to be a glob of pitch, but it is hollow. As the bud develops, the injured side cannot grow, so the non-injured side grows faster and elongating shoots develop a characteristic "shepherd's crook." The larvae will bore down into the shoot at the base of the elongating shoot that then turns brown. All pines are susceptible, especially two- and three-needle species. 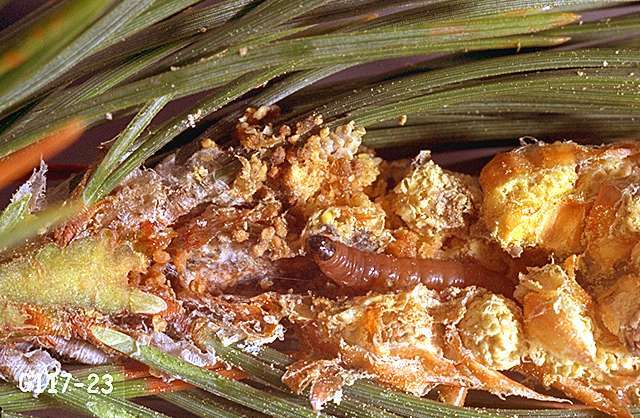 This pest is of cosmetic concern to pine tree exporters and landscape plants. This insect is also under quarantine in some areas and that increases costs to ship greens or Christmas trees to non-infested areas. Biology and life history This insect overwinters as larvae in the mined buds, covered with resin-coated webs. Each larva may infest several buds throughout its growth. In spring, the adult moths emerge and lay eggs on needles near leaf bases in the late spring. The larvae hatch and mine the needle, which then turns yellow or brown. By midsummer, the larvae change buds and mine both buds and shoots below the bud. They spend winter protected inside the infested bud or shoot and emerge the following spring in about June. Evidence of emergence is the brown pupa protruding from the bud. There is one generation per year. Pest monitoring Check for brown buds and yellowed leaves at shoot tips in midsummer. Pheromone lures and traps and degree-day models are available to monitor for adult flight. Successful management depends on applications that coincide with adult moth flight or when larvae change buds in fall. Check Oregon State University On-Line Phenology and Degree-day Models (http://ippc2.orst.edu/cgi-bin/ddmodel.pl?spp=eps). On small landscape trees or shrubs, prune out infested (brown) buds and candles while the larvae are still inside. Be sure to prune far enough below the buds to remove the insects and destroy the prunings. 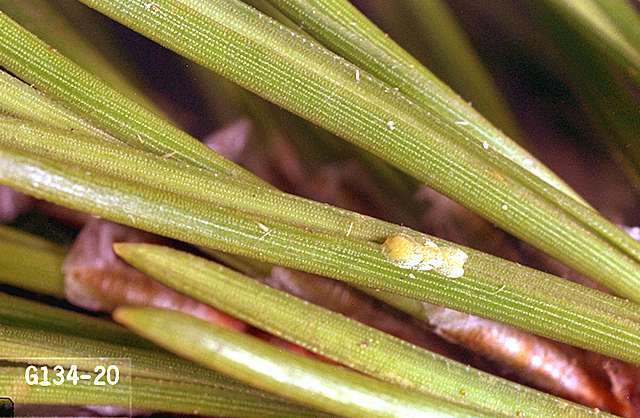 When European pine shoot moth first arrived in Washington, pines were severely infested for a number of years. However, some years after this pest became established, parasitoid wasps began to emerge from infested shoots instead of moths. Populations have leveled off so that only brief isolated infestations now occur.